we have just started work on an additional set of miniatures designed for the crusades into Eastern Europe and next in line will be the Swedish Earl Birger. Hopefully we will be able to how you the master within the next few weeks. http://freie-kurpfaelzische-ritterschaft.de/ then look at "Galerie" or "Die Mitglieder" and at our Forum aswell: http://freie-k-ritterschaft.forumieren.com/portal.htm there you can find pictures, too and some small youtube videos. It would be nice to get some more figures representing the enemies of the crusader knights. 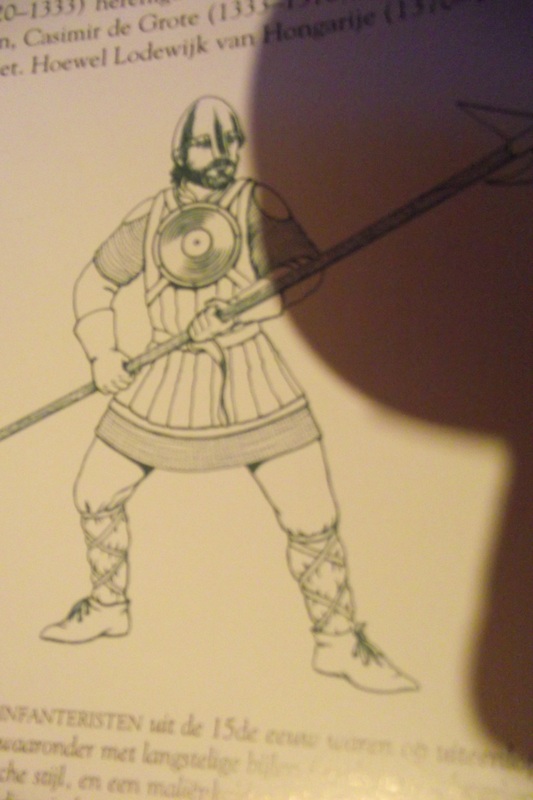 I found this image of a lithuanian footsoldier in a book at home. Maybe an idea ? true I would like to have a set of differen sarazenes. For the dios, I need them really bad. I mostly build dois about the first and second crusade. Well I did consider some Saraceens at one point, but put the idea in the stack. If any then I think that the horsemen of the Eastern Steppes would be my first choise. Yes, it's a good idea. Respect of Lithuanian troops - was the idea, but had to postpone it: the Lithuanian cavalry troop. From the Baltic nations - during this time (second half of 13 century) Lithuanian soldiers were the "cool" and they were hired as mercenaries all the Baltic states - they were known primarily as a horse. Their horses were not high, but sturdy. In addition to the Lithuanians were also many other peoples who fought with each other and against the Germans and against the Russian and went to sea predatory campaigns. It is interesting that in the 13 century they retained the characteristics of clothing and military and civilian devices Vikings 9 th century, but the mentality bore the character of the Gothic age of 4 ... In any case they will be interesting to do in the future. Valdemar has a standing Saladin , it looks great ,if you need , i still have got 1 for you . wow? Are there any pictures of him? the Saladin looks very good. Maybe the one I'm looking for. Well regarding Husite Wagonsm then I know that Orien will release both wagons and a command set in 2011 so that subject is covered.